Standout designs for senior and graduating classes. Branded works closely with schools to mark the special achievements of their graduating and senior classes. Our custom polos are in sublimation or printing featuring student names on the back. The design stage involves compiling garments which are distinctive to elevate the class while remaining consistent with the rest of the school uniform and the school image as a whole. 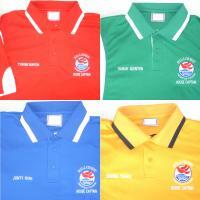 Some examples of our graduation and seniors polos are below. However, these should be put together bespoke for each class and we encourage you to contact us to see how we may be able to assist.